Looking out the window of the Lockheed Electra…. The Nordair Lockheed Electra CF-NAX was droning northward and once again I found myself in the cockpit chatting with the flight crew. As the barren wasteland of Northern Quebec slipped beneath our wings, the Captain asked me a question, “Have you ever seen the New Quebec crater?” My response was that I had not, so with a slight aircraft heading adjustment, he added, “Well today is your lucky day!” It was only a little out of our way, on a beautiful bright winter morning, and hey, Nordair was paying for the Jet A! I am sure the Captain humoured me partly out of his own boredom, but now the flight became somewhat less routine and a bit more of an adventure. After all, it is the little things in life that make it interesting. About twenty minutes later we arrived, and quite frankly there was nothing little about it. As the pilot did a graceful 360º turn around it, I couldn’t see it. I was looking into its centre and had not grasped how large it really was. As I readjusted my vision the co-pilot remarked that in summer you could comfortably land a floatplane on the water within its circumference. It was quite a sight! 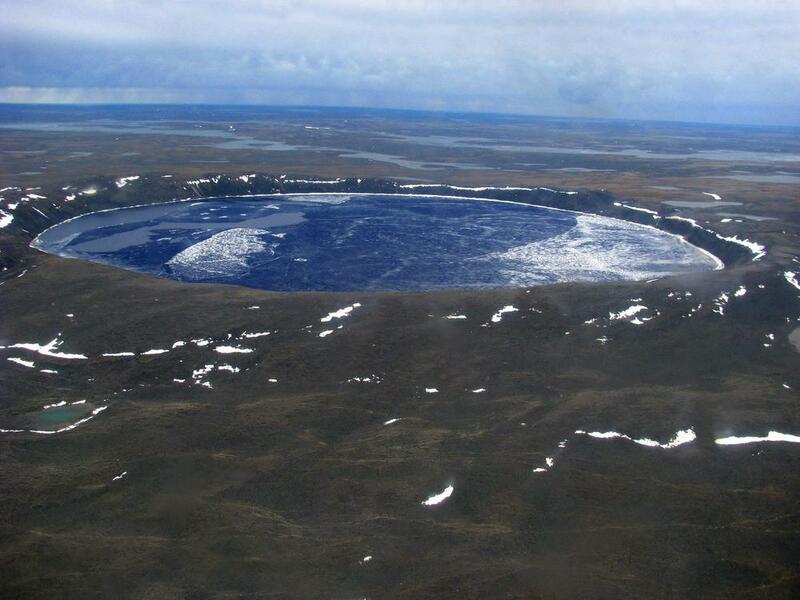 The New Quebec crater, also known as the Chubb crater is approximately 1.4 million years old, with a rim diameter of 3.44 kilometres. In the summer its crisp clear water is 250 meters deep. Not only could you land most floatplanes in it, you could damn near host an annual fly-in! Jim DiCecco was an AME from way back, the kind with the three-digit licence number (M497). He had been with a company doing geological work in the area at that time. The next day Jimmy brought in his glossy black and white photos of a Bell 47 and a DeHavilland Beaver on floats sitting on the water at the edge of the crater. They too had made a slight detour to view this unique ancient landmark. Their experience was certainly a little more intimate than my own, and the delight was clearly on the faces peering back from those pictures. Seeing those pictures made me realize once again how interesting this aviation business can be. We often have the opportunity to visit places rarely seen by the average person. At times this can be under less than ideal conditions with Arctic cold in winter and black flies in summer. Still you would be hard pressed to call the job boring. Many mechanics and pilots have endured the Northern hardships to be treated occasionally to its vast and exceptional beauty. It is a part of Canada that must be experienced to be believed. Jim DiCecco passed away a few years after our crater discussion, unfortunately succumbing to cancer at far too young an age. We had a little ceremony at the College and dedicated our Bell Jet Ranger to his memory with a plaque riveted to its nose. He was a great mechanic, and a wonderful teacher. His tales of working in the Canadian bush are legendary and won’t soon be forgotten. He, like many before him, and I am sure many more to come, experienced first hand the ability of an aircraft to deposit a human being anywhere on the globe. He also experienced the pride in knowing that his mechanical ability was often a deciding factor in whether or not they returned home. I am quite sure that it was that challenge and adventure that kept him going. Flying over the New Quebec crater is not something I will soon forget. Like so many of my early adventures with Nordair, these memories become even more important with age. Perhaps it is because now I realize how exceptional those situations were. At the time, I was just doing my job, and going with the flow of what was expected of me. Now I look back and am delighted that I had such unique opportunities. For those of you who are still out there maintaining aircraft, don’t forget that you are living your own adventures now. Don’t be shy about accepting new challenges and visiting new places. Ultimately you will be glad you did. I doubt Jim DiCecco ever regretted his aviation adventures. I know that I don’t. So get out there and take full advantage of the perks of the trade. See all the world has to offer, however remote or obscure. Oh, and while you are out there, if you happen to fly over a very large hole at coordinates N61º17’ W73º 40’ remember Jimmy…I think he’d like that.